Why Listen to the Odd Fringe Person? Can the outsider say anything of interest to the consummate insider? 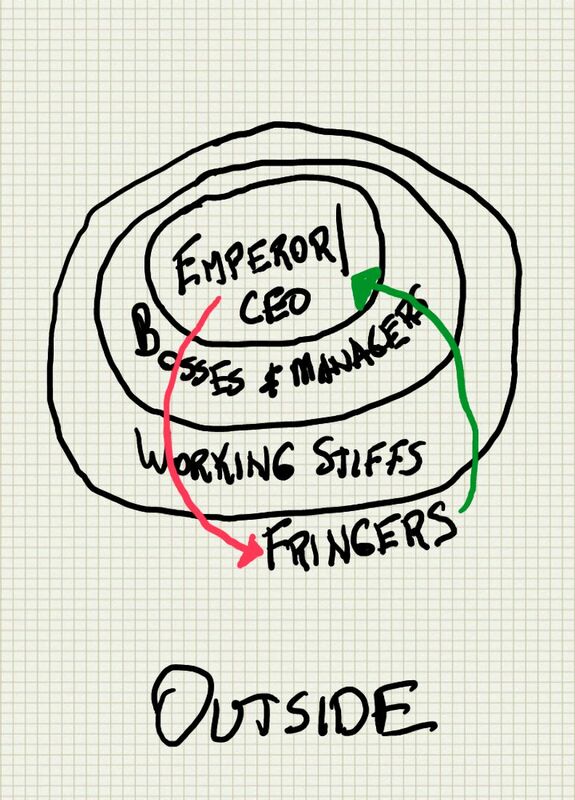 Every organization has concentric circles of members. As new people come in they are indoctrinated into the ways of the tribe and so become insiders and holders of the knowledge. True for businesses, churches, non-profits, ad agencies crocheting clubs and sometimes even families. It used to be that the people on top were the ones with the power and the voice. That was back when an organization pushed its one right way of doing things down through the hierarchy. Members either did things the one right way or they walked. But times have changed and the consummate insiders are desperate (more or less) for new ways to do things to keep the big machine moving. In fact, the big machine seems to be wheezing and seizing more often lately (think Sears or Radio Shack), unable to offer the intimate experience their audiences seek. Part of that has to do with the realizations coming from many voices that there is more than one right way to do things. That is why it is starting to make more sense to listen to the person who has just signed up—they might just have a better, more serviceable idea than those invested in the status quo.